Tourwriter allows you to hide financial information from a selective group of staff. Unticking the new Financial Field option restricts them from viewing the itinerary cost. Furthermore, the group would not have access to the Agent Commission price as well. When the FinancialFields option is deselected, Tourwriter hides all the pricing information in the Bookings tab of the itinerary. To go through the entire list of Permissions and its description, refer to the Permissions in Tourwriter article. 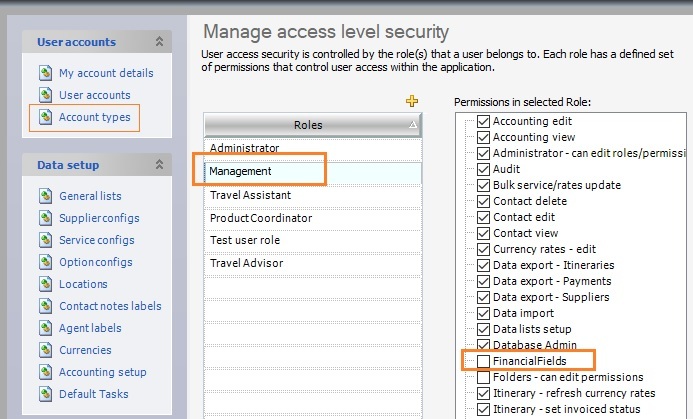 As an Administrator in Tourwriter, navigate to Tools > Setup > Account Types to view the User Roles and Permission list. Add a new User Role or edit an existing role, for example, edit the Management role by clicking on it. Untick the FinancialFields Permission option and save Tourwriter. When the user with the Management role logs in, the financial information in the itinerary stays hidden from them. This user would not have access to the Margin Adjustment, the Gross Adjustments, the Final Price and the Output Currency sections as highlighted below. The Field Chooser will not list any of the Pricing related columns. These columns include the Net, Gross and the Agent Commission columns.